In general, hardwoods are very resistant to the elements & they rot much more slowly than softwoods. They’re also incredibly resistant to fungus & insect attacks. Hardwood decking is a great choice for those looking for a long-term structure that won’t begin to show signs of decay after just a few years. Many experts have commented that it can actually grow to look better with age, like a fine wine! – Is it better than softwood? See below to get the best price today. There are many species of hardwood trees used for decking. These have a very slow growth habit & different types include Oak, IPE, Cumaru & Teak. Because it has been grown slowly over many years in tropical conditions, it is an extremely durable wood. However, this slow growth rate also makes it much costlier than softwoods which are grown quicker & more locally to the UK. The trees for this type of timber are grown in South American rainforests & must undergo costly shipping to Europe. It is also more difficult to process than softwood which adds to its cost. Because of its durability, hardwood decking won’t usually require pressure treatment as most softwoods do. This means there are fewer chemicals & toxins involved in its production. Top Tip: Although this type of decking is naturally denser & more resistant to weathering than softwood, it still requires treatment. Like all timber, hardwoods absorb moisture content & this can cause issues if the moisture content becomes too high for too long. Treating the wood will help to build this resistance to moisture. One down-side is that its hardness can make it difficult to work with, especially when cutting & drilling. Because of the difficulties with drilling, many are sold with special clips or fastenings. These can make the material cost of your structure more expensive. Most new woods are usually a beautiful golden-brown or red-brown colour & decking made of hardwood will usually last at least 20-30 years with the right maintenance. Is hardwood better than softwood? Timber is often classified as being either softwood or hardwood. It’s not actually as simple as labelling one as being better than the other – they are just different. These terms don’t actually describe the relative hardness of the wood but the type of tree from which the timber has been grown. These boards are generally cut from broad-leaved trees grown in tropical conditions. These are very slow growing trees such as Oak & Mahogany. Because these trees grow very slowly, this wood is generally quite expensive as it can’t be re-grown as quickly as softwood alternatives. Most people choose it because it is naturally resistant to weathering & it has a beautiful look & feel. In the same way that softwood isn’t necessarily soft – hardwood isn’t necessarily hard (at least not in the sense that it will split or break easier). However because of its density, it is more naturally resistant to rot & fungus than softwood. And while you can use a hammer & nails with softwoods, hard timber will normally require clips & fasteners that are custom built to work with your deck. At the very least, you’ll need to pre-drill your holes into the boards. Generally, if you’re looking for a deck that’s going to last the duration & require low maintenance (and you’re willing to pay a little extra for the pleasure) these would likely be your preferred choice. See our guide on softwood decking for more information on the big differences between the two types of wood. If you’re looking to purchase new hardwood boards, you can either visit a supplier in-store or buy your timber online. Provided you know the quantity you’re looking for – either option works fine, but remember you will nearly always find the better deal online. It can sometimes be incredibly difficult to understand which supplier offers the best deal, because deck boards are all different sizes & quality. You’ll be pleased to learn that our experts have collected our top suppliers list below, with prices broken down per square metre – so you can see clearly which sites are truly offering the best deal. Remember that we’ve also built our handy calculator – so you can understand just how many boards you’ll need to buy for your build. Wood N' Beyond take our 'top buy' accolade for their hardwood boards. Primarily they've been chosen through such excellent feedback from customers on the quality & delivery of their products. While they are a little pricier than the cheapest on the market (see below) we think it's worth paying that little bit extra for a high quality, sustainable deck surface. There are 6 different types of wood to choose from, including IPE, bamboo & teak. Delivery usually takes place within 3-5 working days. B&Q offer the most affordable option when it comes to hardwood surfaces. At just £33.32 per metre² you can save big bucks on decks with a large surface area. Unfortunately B&Q's range of hardwood is currently limited to just one product. Reviews are limited but the quality is thought to be high & customers can benefit from their next day delivery option. Some customers on Trust Pilot have experienced poor customer service when working with B&Q, so do bear this in mind before you buy. During installation it’s important to remember that hardwoods are generally more difficult to work with, given their durable nature. Although it makes this type of wood less susceptible to splitting & warping, it does mean that it is more difficult to cut & fasten with nails. Our experts recommend that only an experienced woodworker should take on a project which requires extensive hardwood carpentry. You should always pre-drill this type of timber & then screw it. This makes the process much easier (nailing screws into this type of wood ain’t easy!) & helps prevent the boards splitting under the stress. Make sure you’ve got a number of drill bits in reserve! This is an expensive tool which will hold hard deck boards straight while any fasteners are being secured. It works with all decking materials & can be found online from numerous retailers. This is less important with this timber than with softwood – however it should still be a consideration. ‘Cupping’ is the process by which wooden boards tend to bend across their width as they dry-out. This causes them to curve – either upwards or downwards. If they curve upwards (bad news) they can collect rainwater & often need to be sanded down. If they bend downwards then rainwater will drain from them naturally. By observing the small amount of cupping which has likely already taken place with your boards, you can usually ascertain which way up each board should point. By installing each of your boards so that the peak of the cup is facing upwards, it will often flatten out as it dries. Again – less important than it would be with softwood. However after installation, this type of decking has been known to sometimes shrink. By leaving little space between boards, you allow for the gaps to appear naturally. The amount of maintenance you’ll need to carry out depends on the type of hardwood you choose. For instance, woods such as Oak & Teak will require more maintenance than a darker close-grained timber like Mahogany. It’s a common misconception that hardwood decking doesn’t need treating. Even though it is incredibly durable, it still requires treatment to protect against UV rays & the moisture content becoming too high. You will need to find a special preservative which is suitable for treating this kind of surface. Top Tip: There are also specialist preservatives out there such as Owatrol which are designed specifically for new build decking. Many experts recommend giving a new build a sand-down once the structure is complete & then treating with new wood protection. Using a clear oil will help to preserve the natural warm colours of your surface. A penetrating oil finish is best for this type of wood as it will help to prevent damage from moisture, rot & sunshine that will lead to cracking & flaking. 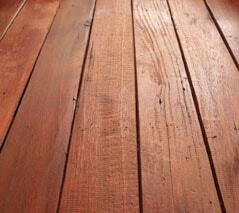 FAQ: How much preservative will I need to treat hardwood decking? Our experts recommend around one gallon of preservative for every 200 square ft. of your structure’s surface, though this does vary depending on how liberally it is applied. Most simply require a one-coat application & can be easily washed with soap & water. You should always check that your prospective preservative is UV & water repellent. Many retailers also offer long-term protection guarantees, though these are not essential. Generally, it’s recommended that you actively look to avoid any finishes that film-form. These will likely peel or flake on areas of your deck which experience high foot-fall. Film-foil products are useful at helping to prevent hard timber from weathering & turning grey – however they peel quickly meaning they need to be re-applied often. If left untreated, most woods such as Ipe will usually weather to a natural grey colour. Some purposefully choose this option as they prefer the look, though it does leave your deck open to the elements. This type of decking can be stained & painted. Some stain treatments also double-up as preservatives. When applying your stain or paint product, always try and work with the grain, not against it. Staining can be carried out immediately during the application of preservative to your boards. If you’d like to paint your structure it’s recommended that you allow the preservative to form a ‘seal’ before painting over the top of it. Most preservatives offer recommended timelines in their instructions – just check the back of the tin! Because of its general resistance to mould and algae, your deck will probably need less ongoing care than many softwoods. However it is still important to maintain your deck with regular ongoing care if you’d like to preserve its lifespan & finish. If you have a high number of trees and plant life in your garden, it’s highly recommended to exercise caution during Autumn months by keeping your structure clean from any leaves and branches that might find their way on or around your deck. This will help to prevent any build-up of fungus & algae. Generally it’s recommended that you use some specialised garden decking cleaner on your structure at least once a year. These can usually be found in the form of capsules which can be easily dissolved in water & used with a wire brush to scrub the surface clean. If your garden is particularly exposed to the elements & undergoes more wear-and-tear than the average deck, it might require more intensive ongoing care. This can be achieved through more regular sanding & preservative treatment. Depending on how exposed your garden is, hardwood decking normally only needs sanding & re-sealing once every 3-5 years. FAQ: What should I do if my surface has turned grey? This is a natural (and very common!) occurrence, resulting from the effects of UV rays on the surface of the deck. To give your structure a fresh look & feel as if it were brand new again, simply sand off the immediate surface & re-apply a new coating of preservative to re-establish a new seal. If you are looking for a deck with near-zero maintenance, you should probably look into composite decking, which has become a very popular choice in recent years. Provided you source your decking from an FSC certified provider, you shouldn’t have too many environmental concerns. Most timbers used for this product are farmed from sustainable sources whereby felled trees are re-planted tree-for-tree. Because it is generally quite durable & does not require pressure treatment, it also means there is less of an environmental impact caused by chemical preservatives such as Copper Azole. However, because of the distance the timber needs to travel to reach the UK (often from South America) there will be other carbon emissions caused by your decking. It also takes more energy to produce this type of timber – the drying process takes longer than less dense softwoods, while hardwoods are usually cut into thinner boards which require more sawing energy. If you are concerned about this impact, you should look into any Carbon Offsetting schemes which can help balance your impact on the environment. Any decking which is not FSC certified also runs the risk of originating from the big contributors to deforestation. As hardwood decking is normally sourced from slow-growth trees – it’s likely that non-sustainable manufacturers will have destroyed habitats & environments within rainforests (such as the Amazon) to source your timber. Given that these trees are usually quite rare, it’s important to find a manufacturer who are environmentally responsible. For this reason we always recommend that you verify where your wood has come from before making your purchase.